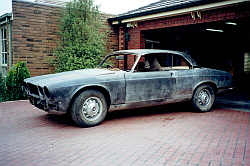 Considering its age, the car was in very good overall condition when I purchased it, however I just felt the need to bring it back to its original condition and then as the project developed the objective expanded and eventually it became a concourse level vehicle..... So began many months of intensive work that at times I regretted ever starting. However the end result justified the drama of an ever expanding project and I gained a great deal of satisfaction from both the restoration and the final result. Basically the car was very original and sound. It had been well looked after by the previous two owners and there were no major problem areas. I fixed a few minor mechanical items and then decided to undertake a complete bare metal repaint inside and out (except the engine bay). The repaint was needed because by the time I fixed some small rust spots, repaired a minor scrape or two and rectified a few small parking knocks I would have to paint or touch-up nearly every panel. So with the decision made I started the restoration of the body and this then expanded to include the interior as well. First step was to completely strip the exterior of all fittings, remove front and back glass, dismantle the interior (except for the headlining) and some of the dash and then remove the bolt on panels. That left me with an almost bare body shell with mechanicals and part of the dash in place. It could still be driven, which was helpful when putting it on a trailer or moving it around as its a very heavy car if you need to push it. To provide the best surface for a full respray I had all the paint removed by Plastic Bead Blasting. This does not distort or damage the panels and gets rid of all the old paint. 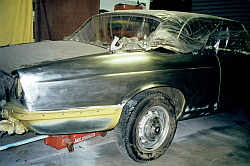 The XJC came back stripped to its original black etch primer which helped to protect the bare metal from surface rust as I worked on the body. Helpful Hint: The dammed plastic beads get into everything!! They take hours and hours to clean out and I don’t believe you can ever get them all. Other people tell me of beads falling out for years. You have to cover and seal everything thoroughly before the bead blasting starts. But be warned - the beads get into the most unexpected places! The inside of the bolt on panels were cleaned and painted with rust preventing paint. Body colour was applied to the inside edges of the doors, hinges, hinge pillars, front mudguards, bonnet, bootlid, boot floor and petrol tank covers. The bolt on panels were refitted with extra sealing in some places and many hours spent ensuring the panel fit and gap alignment was the best that could be achieved. Once this was finished the complete body shell was ready to start the panel repairs. Each individual panel was “file finished” and the minor damage and imperfections repaired to provide an amazing metal finish. A small amount of body filler was used to smooth inaccessible areas then Etch Primer was applied to prevent surface rust and provide maximum adhesion for the two pack HiFill Primer and top coats. I purchased a small compressor which enabled me to do the basic work at home, this was a very good investment and a great help. A two pack refinishing system was my choice for repainting as it provides a tough, durable, long lasting finish with a deep lustre. For the insides of the panels and door jambs etc. the two pack provides a very good gloss straight off the gun without polishing. PPG was the brand and I used their Etch Primer, Hi Fill Primer/filler and top coat. The fumes are highly toxic and an appropriate quality breathing mask must be used at all times and keep your skin covered as well. After the etch priming the whole body received four good coats of Hi Fill primer and a light contrasting guide coat over the top. This was then carefully “blocked back” with wet and dry to pick up all the very minor imperfections and repair marks. To ensure the best finish I hired a commercial spray booth/baking oven and paid a well known spray painter to apply the two pack top coats. He was a real artist and it was a pleasure to watch him at work. 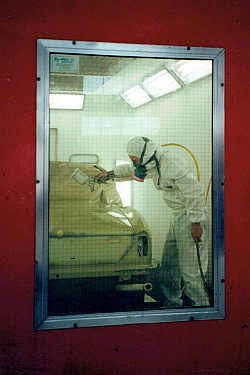 Masking up the body was a work of art in itself and then he pranced and danced around the spray booth as he carefully applied the mirror finish final coats. After baking I finally had a beautifully painted Jaguar to take home.